Add sugar and water to a large heavy sauce pan over medium heat. Swirl pan until a clear syrup forms. Once liquefied, turn heat up to high and cook until syrup turns a rich amber color approx. 5-7 minutes. Remove from heat. Carefully add cream then stir in salt. Continue stirring until a glossy caramel forms. Cool slightly then pour through a mesh strainer into a glass measuring cup. Set aside. Sprinkle gelatin over condensed milk, let stand 5 minutes to soften. Bring heavy cream to a boil in a medium sauce pan. Reduce heat to low. Stir in cottage cheese puree, vanilla seeds, and condensed milk until well combined. Cook until gelatin dissolves approx. 2-3 minutes. Remove from heat, cool slightly, pour into another glass measuring cup. Divide cooled caramel among 4 - 4 ounce ramekins or glass jars, refrigerate for 10 minutes, next top caramel with equally divided panna cotta mixture. Refrigerate for one hour. Put chocolate in a medium mixing bowl. Bring heavy cream to a boil in a sauce pan. Pour hot cream over chocolate. Whisk in coffee and almond extracts until mixture is smooth and all the chocolate is melted. Once panna cotta sets, top with chocolate ganache. Return to refrigerator, chill for 2-3 hours. 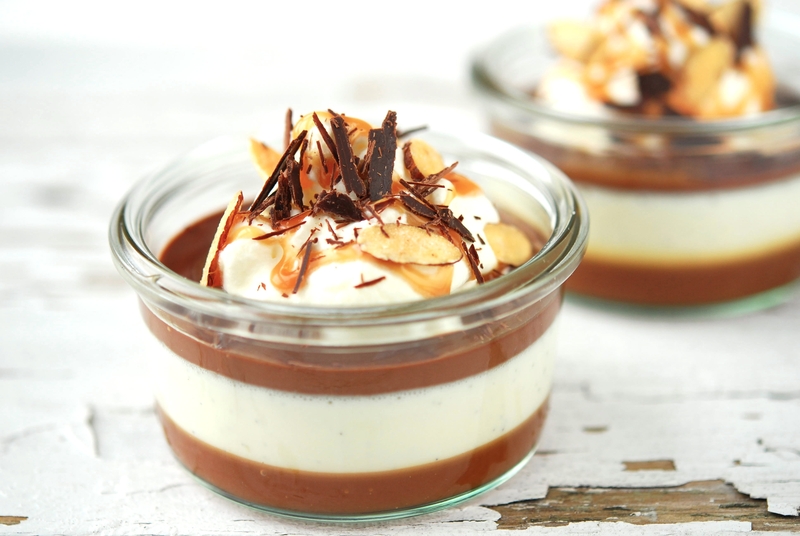 Garnish with optional whipped cream, Maldon salt, chocolate shavings and toasted almonds.